Sacagawea was born in a Shoshone tribe about 1790 in what is now Idaho. As a child she was kidnapped by the Hidatsas tribe and sold into slavery to the Mandan Sioux. No one is certain how Sacagawea ended up with the Canadian trapper named Toussaint Charbonneau, but the two were wed and in 1805 they had a son named Jean Bapiste. Charbonneau was hired as an interpreter and guide and he brought his wife to interpret when they reached her native area. Historian Stephen Ambrose, in his book Undaunted Courage about the Lewis and Clark expedition, contends that the teenage wife was not a guide and was not consulted by either Lewis or Clark. However, they did ask her for advice for a water route when they reached her native hunting grounds. She pointed them to a tributary of the Beaverhead River. A statue of Sacagawea with her baby, Jean Bapiste. When Sacagawea was reunited with her tribe in 1805, Lewis met with the Shoshones Chief. Sacagawea recognized the chief as her brother, Cameahwait. Her reunion with her family cemented the expedition for Lewis and Clark. It may have been the breakthrough they needed since they required native help to get over the Bitterroot Mountains of Montana and Idaho. Cameahwait sold horses to the travelers and provided guides to get them over the mountains. Even with Shoshone help, the expedition suffered hardships going over the rough terrain. But without Sacagawea's family reunion, the expedition would have suffered worse hardship. The expedition reached the Nez Perce tribe, the Columbia River and later, the Pacific Ocean. They wintered at the mouth of the Columbia River and started home in the spring. When they reached the Mandan village, Charbonneau and Sacagawea stayed behind. Following the expedition, Clark offered to school the young Charonneau child, Jean Baptiste. Sacagawea and her husband accepted the offer and moved to the St. Louis area. They had a daughter named Lizette and moved back to the Mandan village in 1811. Shoshone oral tradition says Sacagawea returned to the Shoshones and settled at the Wild River reservation in the area now known as Wyoming, where she reportedly died on April 9, 1884, and was buried there. Other stories say that she died in 1812 of "putrid fever," in the Mandan village. 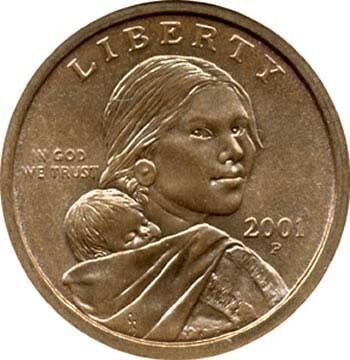 Sacagawea has been honored by the United States through its new Golden Dollar coin. The front features her portrait with her baby, Jean Baptiste, bundled. The Sacagawea Golden Dollar coin.